Ornamental plum trees are often referred to as "fruitless plum trees," having been developed for their attractive blossoms and foliage rather than their fruit. The trees do, however, produce fruit although it is scant and small. Flowering ornamental plum trees may not produce any fruit at all some years. Most varieties of fruitless flowering plum have white to light pink flowers and purple foliage. The trees grow to be approximately 20 to 25 feet in height. Most varieties are rounded in form and have dense branching. They maintain their rich foliage color throughout the summer months. Fruitless flowering plum is available in a number of varieties. The most common types are Newport and Thundercloud. Both feature purple foliage. Thundercloud does well to USDA hardiness zone 5 while Newport is hardy up to zone 3. 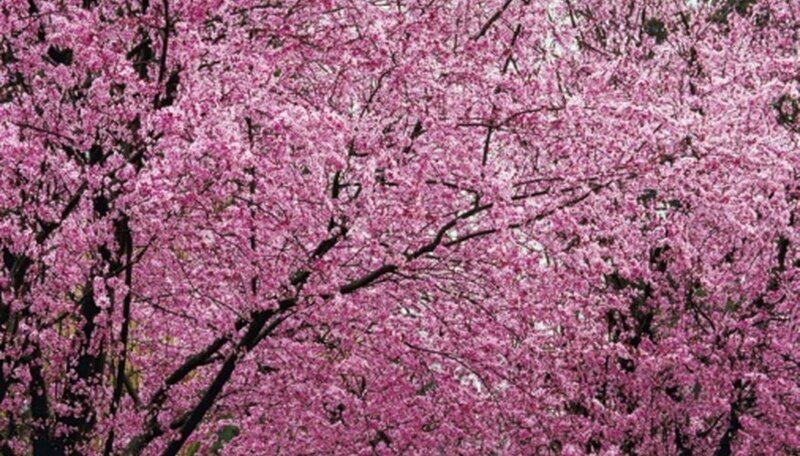 Other varieties of flowering plum with purple foliage include Cistena, Krauter Vesuvius, Mt. St. Helens and Blieriana. Krauter Vesuvius is good for climates where the weather is dry and hot. Cistena and Mt. St. Helens are hardy up to zone 3. Atropupurea and Nigra are varieties of fruitless plum with especially dark foliage. Fruitless plum was developed for its blossoms over its fruit, and each variety has distinctive flowers approximately one inch in diameter. Blieriana plum has bright pink blossoms. The blossoms of Krauter Vesuvius, Thundercloud, Newport and Mt. St. Helens are a soft shade of pink. Cistena plum has very pale pink blossoms. Atropupurea and Nigra have white blossoms. Fruitless flowering plum prefers full sun and well-drained, moist soil. It requires regular maintenance for pruning, fertilization and proper irrigation. Feed the flowering plum a granular, all-purpose fertilizer in the spring. Apply a 2- to 3-inch layer of mulch to retain soil moisture. Do not allow the soil around the plum to become dry. Pruning the tree lightly in the late spring, after bloom, will promote dense foliage. The tree may require occasional spraying to keep it pest-free and vigorous.